Enjoy one of the newer Houseboats in Venice Marina "AKA TUNA TOWN USA"
Reel Therapy House boat is located in Venice Marina. Located down just a few short steps down 'B' dock at the Venice Marina. Its great location only a few feet from the parking area allows easy access so you don't have to carry your supplies or gear very far, or up a lot of stairs! It is situated to accommodate several boats along the end and side of the houseboat. Our accommodations offer 8 beds in a 2 bedroom / 2 bath configuration. We decided to use 'family friendly' bunk beds with full sized mattresses on the bottom and twins on the tops. Each bedroom contains two bunk bed units (2 fulls and 2 twins). Enjoy the large commercial ice machine and grill located on the deck for use by our guests. You will enjoy the large, flat screen TV located in the living area equipped with Dish TV. The living area and large functional kitchen provide an open concept for guest to visit while watching TV, dining and preparing meals in the fully furnished kitchen. There is also a nice serving bar situated next to the dining room table which seats 8 guest. Central heat and air are provided to make your stay comfortable. Prefer to cook outside? How about some grilled fresh catch on the propane grill or prepare a low country boil in the newly added "steam-pot". In order to accommodate guests we have also added a 48" fish cleaning station. There are multiple power outlets and water hydrants (with hoses) conveniently located along the front and side decks for charging batteries and washing boats. The 'mud room', located near the deck, is equipped with a HE washer and dryer. This area also provides a safe place for you to store your rods, reels, tackle, foul weather gear, etc. when necessary. Launch your boat only once and enjoy pulling up to your home away from home for a break from the fishing, without having to load and haul your boat to a motel. The Crawgator bar and grill is a short walk up to the marina. It offers a full bar and prepare awesome meals for those days the fish wore you out and you just don't have it in you to cook. Crawgators also offers a 'You Catch it we Cook It" program (for a small fee pp) which is absolutely scrumptious! NOTE: WE URGE ALL RENTERS TO PURCHASE TRIP OR TRAVEL INSURANCE THROUGH VRBO. The love of fishing brought us to Venice over 15 years ago. Thru the years we have visited many times while fishing the SKA King Mackerel Circuit as well as the FLW Kingfish Series. In more recent years it has been more pleasure trips than tournaments that has brought us back. Venice has many names - "Fishing Capitol of the World"- "Tuna Town USA" and there is a reason behind this! Venice has come to be known as one of the BEST inshore and offshore saltwater fishing destinations in the USA! The inshore fishing is some of the most productive in the world. Where else can you go almost any day of the year and catch enormous Bull reds Or limit out on trout before lunch? The offshore fishing is "Off the Hook" hooking up with Yellowfin Tuna, Amberjack, Grouper and Cobia less than 15 miles from the dock! Nowhere else in the Gulf of Mexico can you go and catch the size and quantity of fish as Venice, LA. This is why we as avid fisherman had to have a place in this fishing mecca! Come Enjoy and See what this end of the world is all about! Tight Lines, Calm Seas & Fair winds to all. This houseboat was designed with the guest in mind. 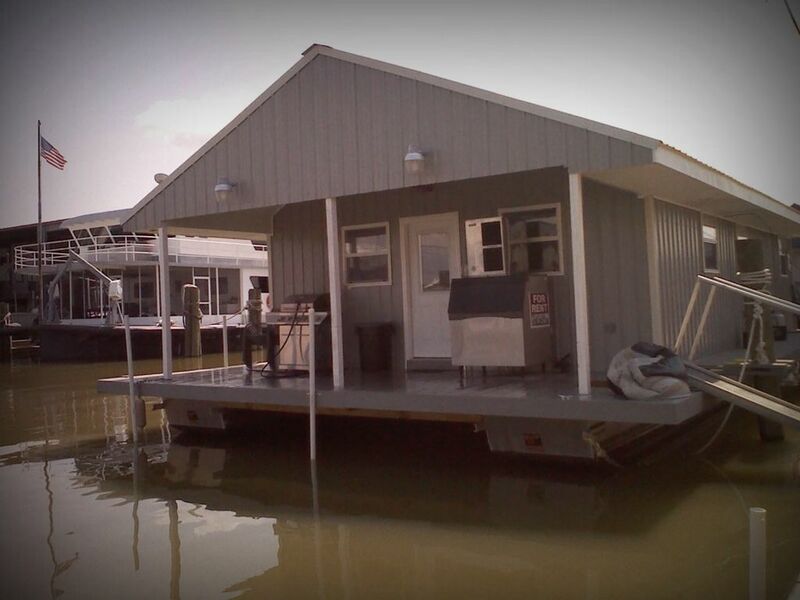 This houseboat has something that families can enjoy, as well as a bunch of ole' fishing buddies or even couples! It's affordable, yet nice enough to bring clients and business associates for a weekend fishing adventure. When you consider that the nightly rate is virtually the same price as "2" motel rooms it makes the ideal solution and convenience of the whole group being able to stay together. The ease and convenience of not having to launch your boat each day or the lack of 'hang out' space at a motel, it only makes sense to stay with us. Convenience was definitely an important factor in our decision to locate at Venice Marina. The close proximity to the parking area is a huge plus for the houseboat. Our guest enjoy a short walk to the houseboat. The houseboat faces the east, so our guest can enjoy sitting on the deck in the late afternoons during the summer without the hot sun bearing down on them. Additionally, the houseboat is situated on the inside of the houseboat docks, resulting in little if any wave action from commercial and recreational boat traffic in and out of the marina. By staying with us, you are only a short walk to the marina dock where you can meet your charter captain, if you are going out with one or you can have them stop right outside the front door of the houseboat to pick you up! The marina store is open early enough for you to grab those last minute supplies as well. If you want more information about guided fishing or hunting trips in Venice, don't hesitate to contact us for more information. We will happily recommend some of our favorites to you. Located within the quaint fishing village of Venice Marina, better known as TUNA TOWN, USA! HE Washer please bring proper HE detergent for use. Large Leather couch and side chair, with additional bench for added seating. Side by Side w/ nice sized freezer. Oven is Gas, please ensure outside propane is turned on before use. Fully stocked kitchen is provided. Numerous pots/pans,Dishes, cooking utensils, grilling accessories are all provided for our guest to use. Perfect set up for an amazing Venice get away! If you want the perfect houseboat for your Venice, LA hunting or fishing trip this is the place. Everything you could ever want or need for your trip is right here. From WiFi, to cooking equipment, to the ice machine, to the grill, to the location on the Houseboat dock. No reason to stay anywhere else. Amy went above and beyond making sure we enjoyed our stay and had what we needed. Cant wait to get back! First class. Home away from home. Everything we needed was there for you to use from bedroom and bath lenin. We had a wonderful time and our plans are to come back again next year. Newer houseboat with all of the amenities. You will not be disappointed. Everything you need. Clean and easy. Had a great stay at reel therapy. The house boat was great. Very clean, lots of space, and we enjoyed grilling out several nights while we were there. I would highly recommend staying there and we will be back again! This is a very clean and well kept camp at Venice marina. Owners are very nice and attentive.